After last month’s TechCrunch Disrupt, and to provide a business companion to the popular “Lean Startup” customer development methodology, this TC Teardown focuses not on how one specific company makes money but rather seeks to provide a breakdown of the main general ways consumer Internet startups try to make money. Consider it a guide to Internet business models. If you are currently thinking about or are in the process of developing your own consumer startup idea, these key business models will help give you a working knowledge of what it takes to get to $10 million in revenues (assuming you have a good product that the market wants). You can think about consumer Internet companies in three major categories. 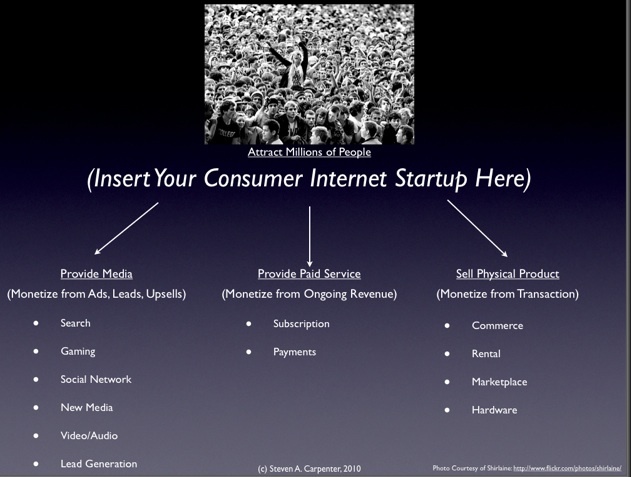 The following three categories of consumer Internet startups and the representative underlying thirteen business models should give you a more than basic understanding of the main drivers of 95 percent of the consumer Internet startups you hear and read about on TechCrunch. The best consumer investors are intimately familiar with these metrics, so make sure you know which business you are in and how you can get to $10 million before meeting with them. The two main points I am trying to convey are 1) the activities needed to monetize each kind of consumer Internet startup are different and 2) the activities are not difficult to understand. Currently there is not a good resource to demystify the various consumer Internet business models. In my effort to reduce these to basics elements, I know I have likely overlooked something obvious. Please feel free to comment or email me at tcteardown at gmail to let me know what I may have overlooked or to introduce your truly unique take on one of the models so that I can update this post and it can be useful to others. You can also view, download, and use each of the below financial models here. As a consumer Internet company, you are trying to attract enough potential customers by providing one (or more) of three kinds of products: 1) media, 2) premium services, or 3) access to a physical good. These are not mutually exclusive—a startup can generate revenue from more than one of these sources. For example, many media companies make money off of both advertising and premium services, like LinkedIn. If you are a media company, you are providing free content and collecting purchasing intent so that you can either sell ads, send leads to products or services your audience might be interested in, and/or upsell to a subscription or digital goods. This category is comprised of a large percentage of consumer Internet startups because startup costs are typically the lowest. As has been said many times before, these kinds of companies are cheap to start but expensive to achieve scale. Representative media startups are those creating applications in search, gaming, social networks, new media, video and audio, and lead generation companies. If you provide a paid service, you are trying to attract as many potential consumers to you as cost effectively as possible, get them to pay you for a service, and then work to keep them as paying subscribers for as long as possible. Most startups in this arena follow the “Freemium” strategy, where some content or basic service is provided for free in the hopes of converting a small portion of the free base to paying subscribers. “Freemium” is by no means the only way to acquire customers, but it can usually be the most cost effective means, especially if the service is built upon cheaply produced media or third-party infrastructure providers such as Amazon’s S3, and the variable costs to serve a new customer are minimal. Payments and financial services companies are included here because they provide some services for free or for a fee and also charge businesses a small percentage of each transaction. Representative startups are companies that create premium subscription services, new banks or investment firms, and payment companies. These kinds of companies frequently require more capital than media startups to start, but may need not as much to scale, since they can leverage the cash paid in from consumers. If you sell a product that is fulfilled via a warehouse, can be sent via UPS, or is a coupon that can be used to purchase goods and services in the real world, you are running a commerce company. These startups generate revenue for each transaction and need to be disciplined around the efficiency of their warehousing operations, returns and customer service, and the amount spent on sales and marketing. Below you can see a chart depicting the 13 consumer Internet business models (with examples), the 3 or 4 key monetization drivers for each, and the scale a company needs to achieve to get to an annual revenue run-rate of $10 million. Of course there are lots of activities companies in these categories need to do well, but these are the most important drivers to building a sustainable business. Below is a brief overview of the first four company types with corresponding mini business models so you can see how the key drivers work. The remaining business models will appear later in Part II. These metrics are inter-dependent so the number of uniques per month you need, for instance, will largely be dependent on the average revenue per click you can command. For a company where 5 percent of searchers click on paid links and command $0.35 per click on average, the company needs to have 2.5 million monetizable clicks per month to get to $10 million in revenue. Hunch is a good example of a startup that combines elements of traditional search with a new-kind of service, in this case a personalization engine, to provide more accurate product recommendations, and therefore, hopefully will achieve higher conversion rates and better revenue per click. As this is a volume business, gaming companies need to achieve at least 5 million monthly average users to have a chance to hit $10 million in revenues. In this last way, social gaming companies, like Zynga and Nexon, combine elements of traditional media with commerce by replacing fulfillment of a physical good with a digital one. Startups that create media around shared experiences or common interests typically make money from ads and sponsorships, and less frequently, premium services. As a new media company, a social network like MyYearbook (junior high school students) or Dogster (pet lovers), cares about how many unique visitors a month they are attracting, how many ad impressions they are able to display, how much of their inventory they can sell, and the average rate an advertiser will pay. In general, the more focused the social network is on a particular vertical, the higher the CPM rates tend to be. A startup needs to get to several million users and high repeat usage to offset a typically low CPM media buy. The hardest to define of all the startup types, and also the hardest to predict their ultimate success, are new media platform companies which create content around new technology-enabled experiences. Many of these companies are commonly thought of as social networks. But Facebook, Twitter, and Foursquare are all examples of startups that require consumers to change current behavior and consume media in a new way. For Facebook it is providing a new way of keeping up-to-date with our social network; for Twitter it is providing a way to interact directly with newsmakers and current events; for Foursquare it is providing a way to stay up-to-date with our friends and family’s whereabouts. Key metrics here are the number of people you can attract to your service (both creating content and consuming it), the number you can convince to change their behavior to create new content (status update, tweet, check-in), and the percent you can monetize in this new format. The great thing about these companies is that if you can convince people to use these new tools and consume the content, you will likely have a fast-growing business that easily surpasses $10 million on very little capital. The challenge is that these companies are typically hit-driven, winner-take-all businesses that require significant capital to scale. And you will likely need to convince media planners and advertisers that creating a new ad format is worth their ad budget. Editor’s note: Contributor Steven Carpenter regularly writes the TC Teardown column. He was the founder and CEO of Cake Financial, which was sold to E*Trade earlier this year. His last guest post was a teardown of group buying site Groupon.